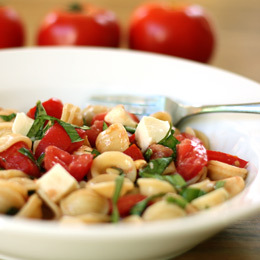 This recipe mixes two of my favorite dishes together: caprese salad and pasta. It's a perfect refreshing meal for this hot summer. I love the taste of balsamic vinegar and garlic. YUM! I think a dollop of pesto could easily substitute for the balsamic when you want to change things up a bit. Bring a large pot of water to a boil and salt it heavily (it should taste like seawater), then add the pasta and cook until just done. Meanwhile, prepare the tomatoes and cheese and put them in a very large bowl. Whisk together the vinegar, olive oil, garlic, mayonnaise, salt, and pepper to taste; the mayo will help keep the oil and vinegar from separating. Drain the hot pasta and shake it dry (don't rinse it), then add it to the bowl with the cheese and tomatoes and stir with a rubber spatula to combine. Add about half the dressing, and stir again, then fold in the basil and pine nuts. Now taste the pasta, and add more dressing, if it needs it, and more salt, which it will almost surely need. If you have time, cover it and let it sit at room temperature for an hour or so to let the flavors blend and to let the pasta absorb some of the juice that will come out of the tomatoes (don't refrigerate it, or the pasta may get tough and the tomatoes may get spongy. Taste just before serving and re-season as necessary.